Central Museum or the Albert Hall lies in the Ram Niwas Garden. It is a vast and verdant garden housing a zoo, a greenhouse, an aviary, a museum and a sports ground. Maharaja Sawai Ram Singh II built it in 1868 as a relief project for his famine struck subjects. The Albert Hall has been modeled on the Victoria and Albert Museum in London and is afine example of Indo-Saracenic style of architecture. The hall was named after Albert, the consort of Queen Victorias husband. Alberts son the Prince of Wales (later Edward VII) laid the foundation stone in 1876. It was designed and devised by Colonel Sir Samuel Swinton Jacob (1841-1917). It now houses an exquisite collection of metal ware, decorative wares, miniature portraits, sculptures, paintings, natural history specimen, an Egyptian mummy among various other objetart. Rajasthani village life is also displayed through costumes, pottery, brass-ware and woodwork. The Durbar Hall, usually locked, houses several stunning carpets including the magnificent Persian Garden Carpet, one of India’s finest art treasures. It was made in Kerman, Persia in 1632 and represented the garden of paradise based on a quadrangular design. The museum also has some melancholic specimens on display like a horse skeleton, a human skeleton, and a stuffed cobra. Sometime back the Ravindra Manch with an auditorium, a modern gallery and an open-air theatre has been added to the museum to promote cultural events. 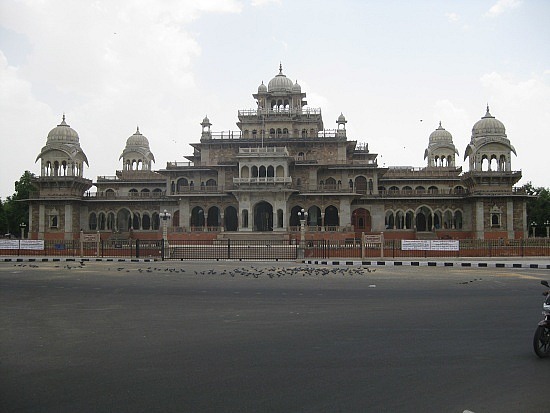 Albert Hall is very famous place in Jaipur.